This light and almost creamy Rhubarb Upside-Down Cake Recipe is an all spring and all delicious. Read on for this easy rhubarb cake recipe! 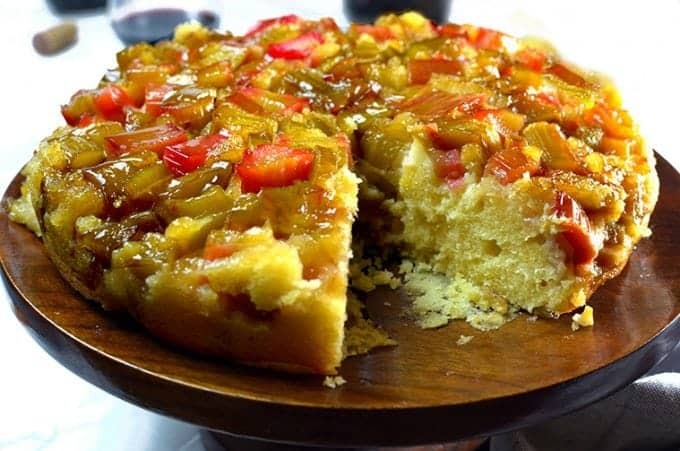 Try this rhubarb cake recipe this spring. 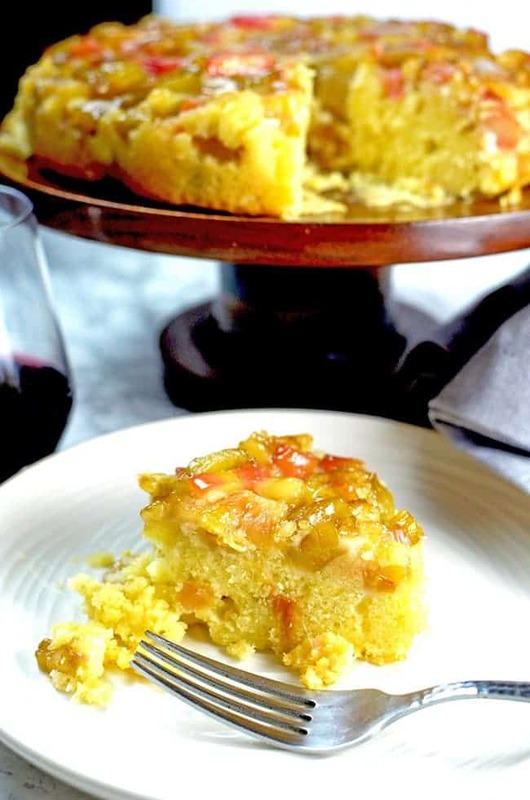 I was a bit intimidated by this rhubarb upside-down cake recipe because, well, it’s a cake recipe! Our collection of cake recipes is continuing to grow here on Platter Talk, and yet every time that I put a cake together, I have the same cluster of fears. What if it’s too dry? What if it’s soggy? What if it falls in the center? What if I completely screw it up? As I have discovered over the years, this fear of baking cakes that I have is almost always unfounded, and I can safely say that this is true with most of you reading this (if you too have such a fear). Perhaps it’s because I don’t work with rhubarb very often that I was especially anxious about making this particular cake. Happily, when all was said and done, all of that anxiety was one of the biggest wastes of my energy, ever. 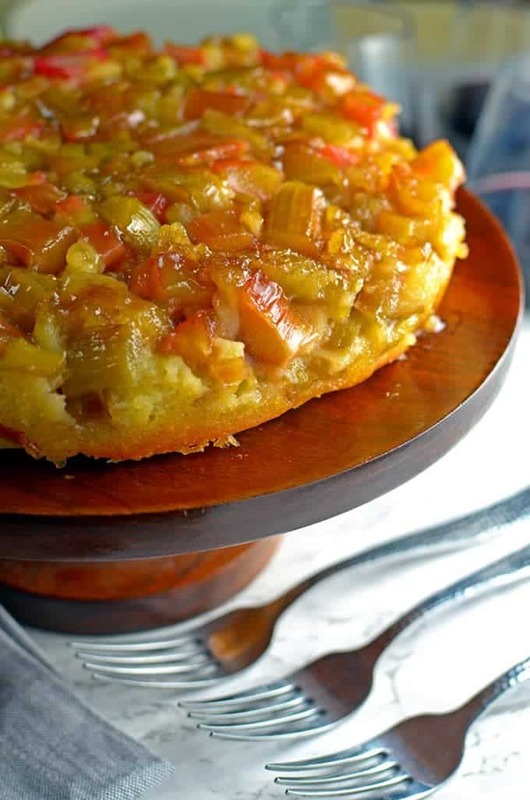 This rhubarb upside-down cake recipe uses about 4 cups, or about a pound and a half of sliced rhubarb and just to be safe, I decided to use my trusty kitchen scale. If you don’t have a kitchen scale, please get one now. There are a thousand and one ways to measure ingredients but there is only one way to measure ingredients precisely and with accuracy and that is by weighing them with a kitchen scale. A cup of flour to you may be an entirely different cup of flour to your neighbor. Certain flavors and ingredients pair well together. As I found out, we can add one more match that is made in culinary heaven to this list: Rhubarb and Lemon. Fresh lemon zest brings extra flavor to this rhubarb cake recipe. 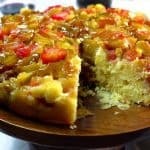 Aside from the typical cake ingredients like flour, butter, and eggs, there is something else that’s special in this rhubarb upside-down cake recipe, and that is sour cream. Not a lot, just a third of a cup but enough to give the cake an understated creamy texture. It’s pure heaven on a plate. The batter may curdle initially, after the lemon juice and sour cream is combined when making this rhubarb upside-down cake recipe. Although this may look weird, it’s completely O.K. 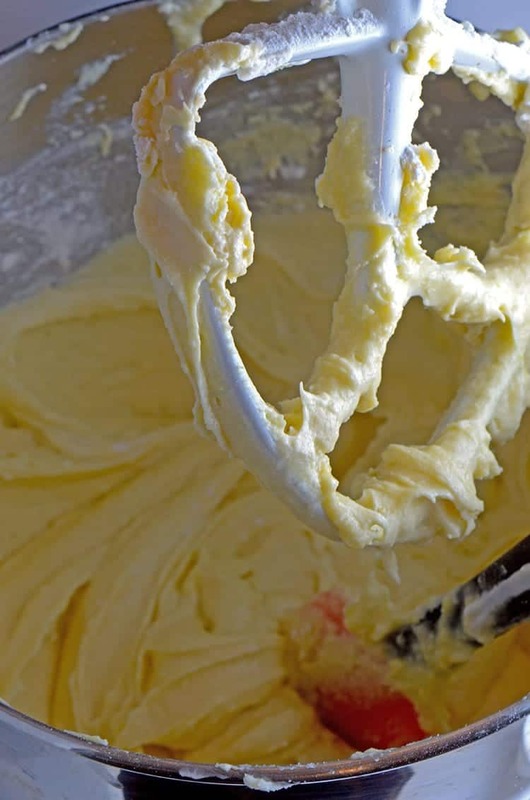 You can see that with the addition of the remaining batter ingredients and a few minutes in the stand mixer, we have a luxuriously smooth and creamy cake batter. A brown sugar and butter base is evenly distributed in a parchment paper lined and buttered spring-form pan. 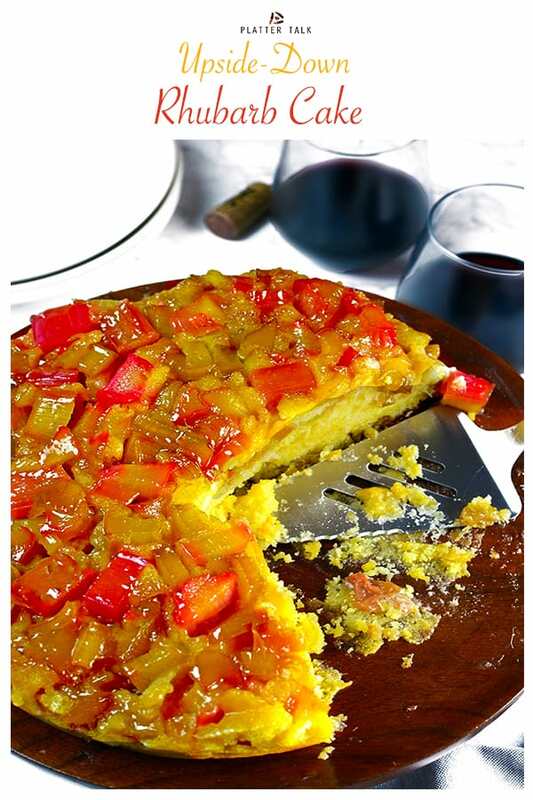 Next, chunks of rhubarb and their juices are added, and finally, the batter is evenly poured, before placing this rhubarb upside-down cake recipe into a hot oven that is preheated to 325° F.
This upside-down rhubarb cake in perfect for any spring get-together! It takes about 75 minutes to bake this beautiful rhubarb dessert and take my word for it that it is worth the wait! This rhubarb dessert is simple to make with great results. I was hoping this rhubarb upside-down cake recipe would turn out well, but I was truly surprised at just how delicious it is to taste. This is easily one of the best tasting cakes that I have made. Remember how I mentioned that I have a fear of making cakes? Maybe it’s time that I just get over that particular insecurity. 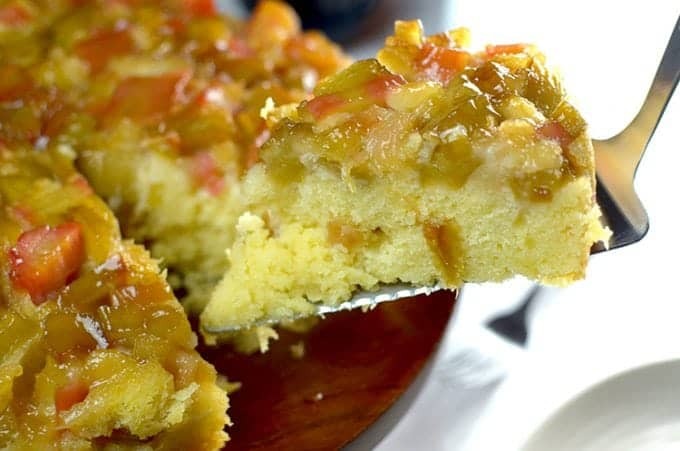 Maye it’s time that you try this rhubarb upside-down cake recipe. Make this Rhubarb Cake in your kitchen! Looking for more rhubarb recipes? Have a sip of our Rhubarb Slush! For more great information and recipes on rhubarb, read All About Rhubarb, from The Spruce Eat. Preheat oven to 325°F. Line the bottom of a 9 inch spring-form pan with parchment paper and then grease the sides of the pan and the parchment paper with butter. Next, wrap two layers of aluminum foil around the base of the pan. Place the spring-form pan on a rimmed baking sheet. Using medium size mixing bowl, combined rhubarb and 1/2 cup sugar and stir well. Sprinkle cornstarch into mixture, while stirring gently until thoroughly combined. Place 1/2 stick of butter into a small sauce pan over medium-low heat and slowly melt it. Add the brown sugar, whisk until smooth, about 2 minutes. Next, combine combine cake flour, baking powder, and salt in a small mixing bowl. Gently stir together until well combined. 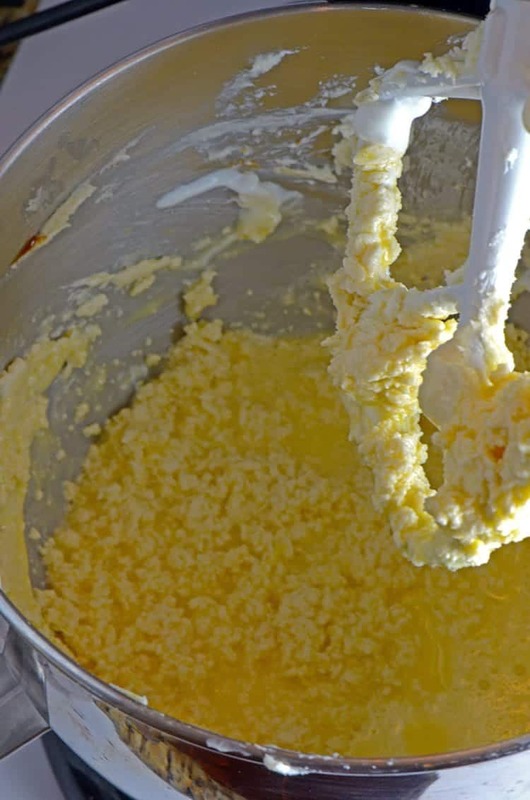 Using the paddle attachment of a stand mixer, whip the 2 remaining sticks ( one cup) of butter for about two minutes. Lower the mixer speed to low and add remaining 1 cup of sugar. 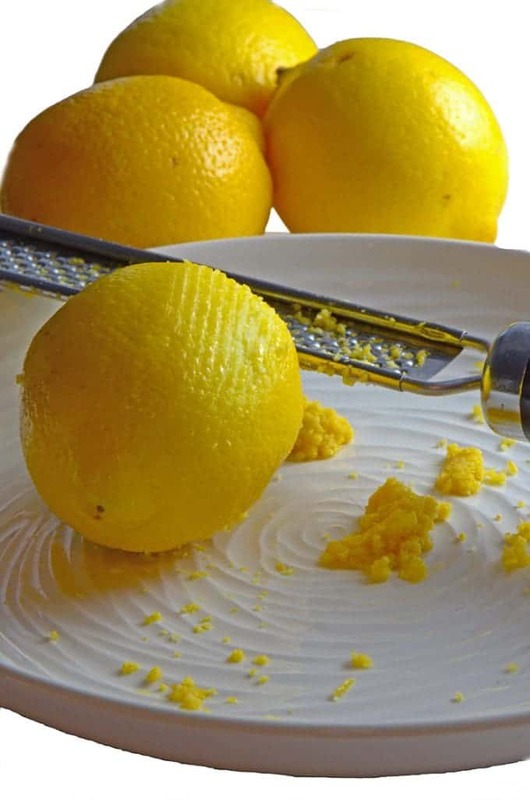 Turn mixer off and use your fingers to blend in the lemon zest until completely mixed in and the mixture is uniform in color. Next, add the vanilla and cream this mixture together in the sand mixer, for about four minutes. Reduce speed to low and add the eggs, one at a time. Use a rubber spatula to scrape sides and bottom of bowl after the addition of each egg. Add the sour cream and 1 tablespoon of the lemon juice. It's normal for the mixture to curdle at this point. With the mixer speed on low, add the flour mixture a little at a time and scrape the sides and bottom of the bowl as you add the dry mixture. Use a tablespoon or rubber spatula and pour the brown sugar and butter mixture into the prepared spring-form pan. It may be necessary to gently reheat the mixture prior to doing this. 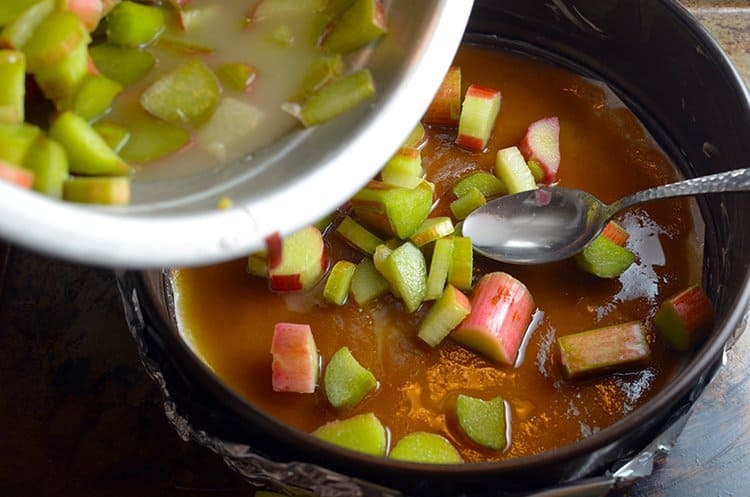 Next, spoon the rhubarb pieces and their juices onto the brown sugar and butter base. Finally, spoon the cake patter over the rhubarb, making sure to evenly distribute the batter and smooth it out with the back of a spoon or a rubber spatula. Bake for 70-75 minutes or until firm and a tooth pick comes out clean after being inserted in cake's center. Cool on a wire wrack for 15 minutes and then use a paring knife to loosen the edges of the cake from the sides of the pan. Place a serving platter on top of the spring-form pan and invert while the cake is still warm. Waiting too long to release the cake from the pan may cause it to stick to the sides of the pan. Making this right now , can’t wait for it to finish! I think in the instructions it was left out how much of the sugar to combine with the rhubarb so I had to extract some and try to make it work. Just a heads up for future bakers! Thanks so much for the heads-up. It should be 1/2 cup of sugar which we have corrected in the recipe instructions. We hope you enjoy this rhubarb dessert! My grandma always made THE BEST rhubarb pie every summer! 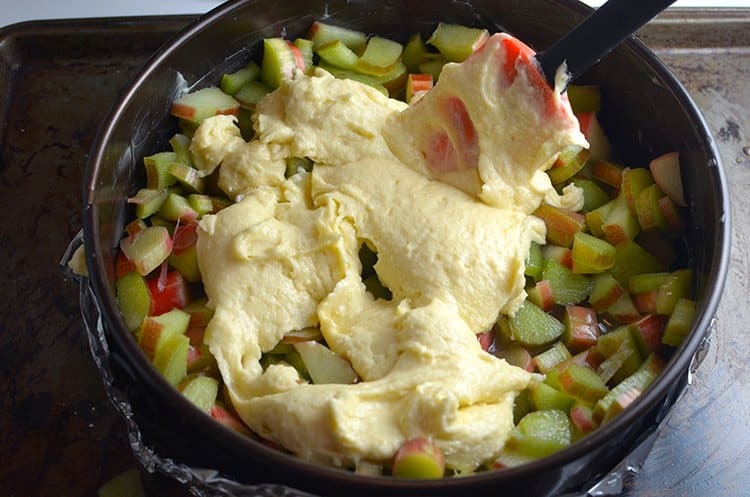 This recipe totally makes me miss Wisconsin and it’s glorious rhubarb! Can’t wait to try this one out! Thanks, Jessica. 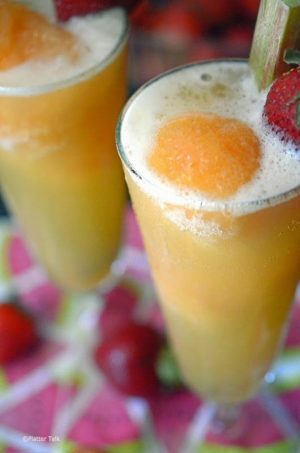 Rhubarb has a way of bringing back fond memories and great flavors. I hope you try this one out, sometime soon. Rhubarb is my favorite springtime treat! My husband had never had rhubarb until two years ago, I can wait to make this yummy treat for him, I know he’ll love it!! Strawberry rhubarb is such a great sweet and tart combination. 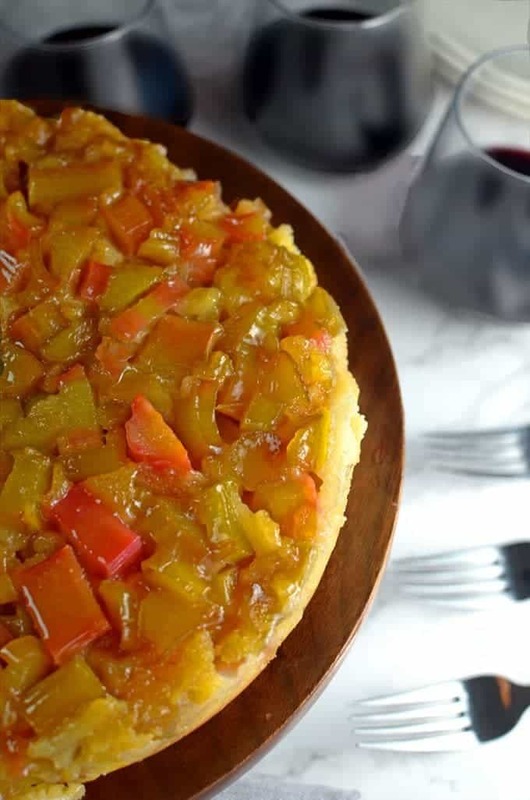 I usually make mine into a sauce or a cobbler, but this cake definitely has yummy possibilities! This makes me so excited to get rhubarb this weekend. I’m moving soon and want to try to make a rhubarb recipe before I do (and naturally misplace half of my kitchen tools – you know, because moving). 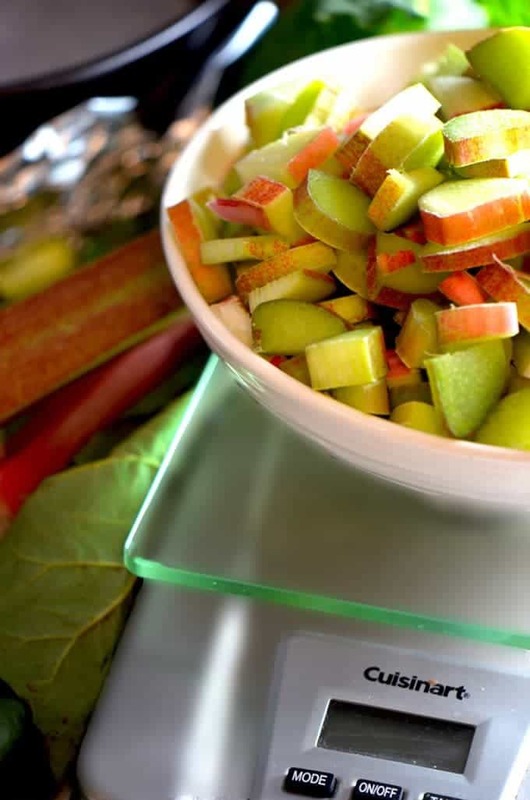 I’ve never worked with rhubarb but this recipe looks like a great place to start!! Looks yummy!! Yes! to rhubarb and lemon! I’ve never cooked with rhubarb but at school I loved rhubarb crumble with custard. 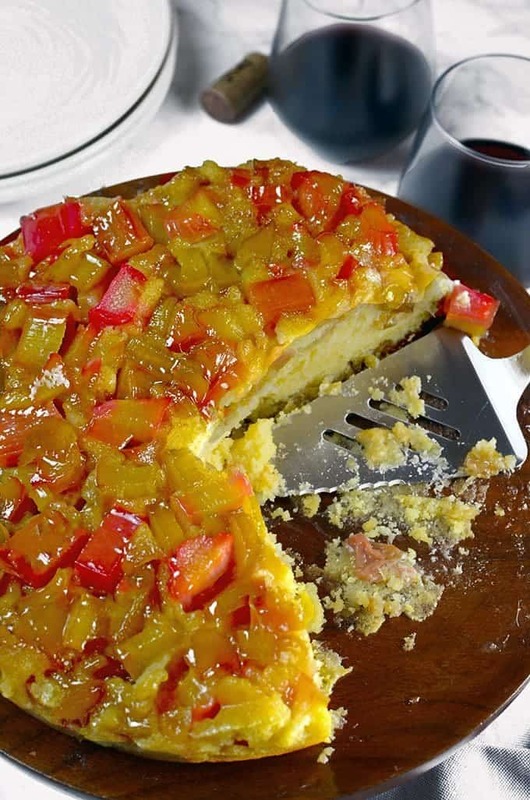 This cake sounds lovely, the combo of sweet, tart and sour – yummy! What a wonderful looking cake! I’m a big fan of rhubarb! This is perfect for casual entertaining. Yummy! This looks delicious and I wish I could smell it too! This would be a fun treat for a party spread or any day of the week really! Thanks for sharing! Luci’s Morsels | fashion. food. frivolity.